Our tribute to Wrigley Field replicates 46 features of the real park. Here are a few of them. To see and enjoy all of them, plan a visit or reserve the field for your group. 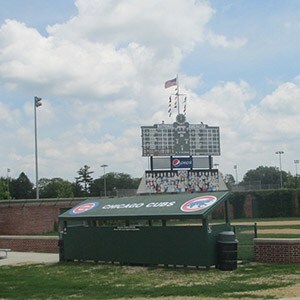 Our scoreboard is a faithful replica of Wrigley Fields’ iconic hand-operated board. It includes the famous field clock, which hasn’t lost time in the 78 years since it was installed. 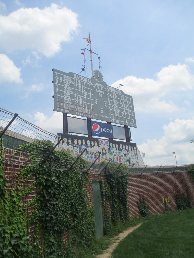 Below our scoreboard is our centerfield mural, which depicts (in caricature) Cubs fans taking in a game. Places in the mural were made available for purchase as a fundraiser. The spectators include actor Bill Murray, known to be a devoted Cubs fan. And yes, Bill did make a donation! 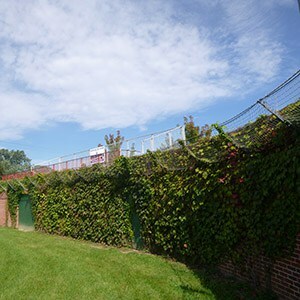 Few structures in the world of sports are as recognizable as the ivy-covered brick walls of the outfield at Wrigley. 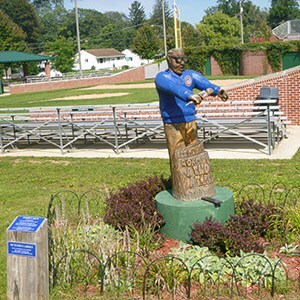 Our ivy was planted by Marya Veeck, the daughter of Hall of Famer Bill Veeck, who planted the ivy at Wrigley Field in 1937. One of our ivy plants is an actual transplant from Wrigley, but only two people know which one it is. The walls of our stadium are built from 18,500 bricks, all donated by Yankee Hill Bricks in Lincoln, Nebraska. They were laid over a four month period in 2007 by Bricklayers Local #6 of Rockford, Illinois. The bricklayers even embedded a penny for luck in the mortar of the left field wall, just like the real Wrigley field. 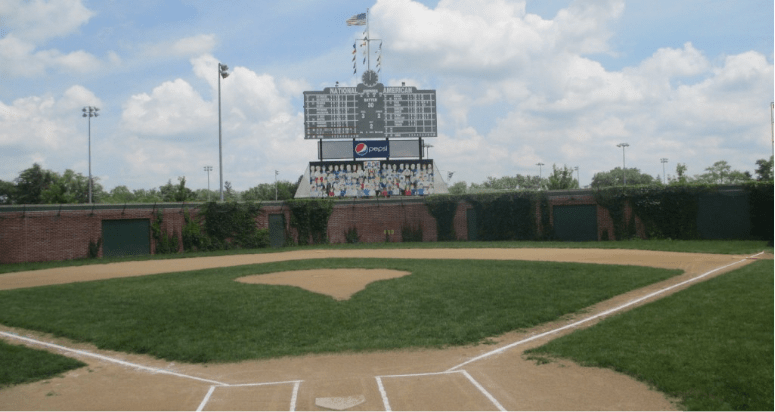 What would a Wrigley replica be without bleachers? 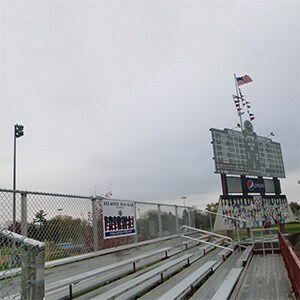 Our version of the famous left field bleachers was funded by a battalion of Bleacher Bums who gave $100 donations. Each donor was recognized with an attractive plaque affixed permanently to a bleacher seat. 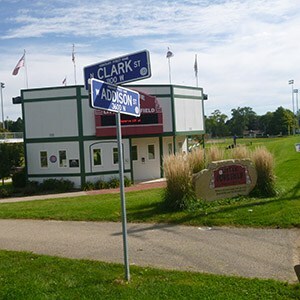 We’re still placing plaques in return for donations to cover future costs, so if you’d like to put your family or business in the bleachers permanently, go here. 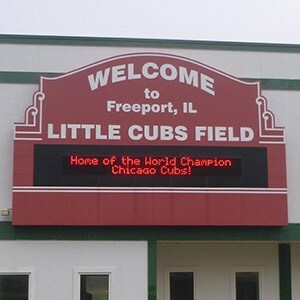 In addition to the ivy, the Cubs organization has kindly provided other items from the real stadium. 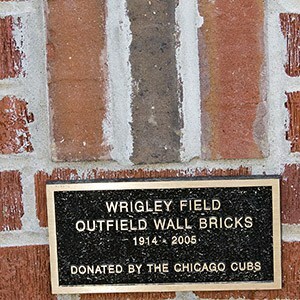 Three bricks taken from a wall at Wrigley can be found mounted in our wall to the left of home plate. And as you walk around Little Cubs Field, you’re also walking on the grounds (or we should say, ground) of Wrigley, because the Cubs donated dirt and grass from the real field in 2007. In the dirt we found window glass, tile, nails, and pieces of beer bottles from the early 1900’s. 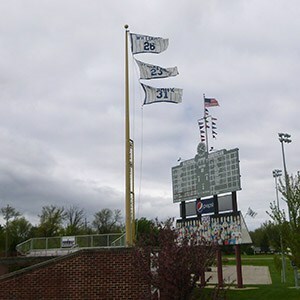 Keep your eyes peeled as you tour Little Cubs Field, because if you do you’ll notice a number of other donated items from Wrigley. Our dugouts carry authentic representations of the legends on the dugouts at Wrigley, modified slightly for our setting. Each dugout is also equipped with a bullpen phone, because you never know when you’ll need to warm up a relief pitcher to put Cleveland away. When you’re standing near the marquee, be sure to look across the street to see another special feature honoring the Cubs.